As Gyeongju is a small town, finding convenient ways to get there can be quite confusing. There are no flights going into Gyeongju, but there are several other ways you can get here, depending on your budget and preferred mode of travel. The fastest and most expensive way is the KTX, the second being the normal train and the last being the bus. Below are the methods to easily travel to and from Gyeongju. 1. KTX: There is KTX service to Gyeongju if you're looking for something fast. The KTX, however, stops at the Singyeongju Station, which is slightly outside of the city and not the Gyeongju train station in the city. We took the KTX from Seoul when we visited Gyeongju, which cost us about 50,000 won. The entire train journey took about 2+ hours from Seoul to Singyeongju, and we had to switch to a bus from Singyeongju to Gyeongju. The trip was quite fast though, considering we traveled from one end to the other end. You can also consider taking the KTX from Busan. 2. 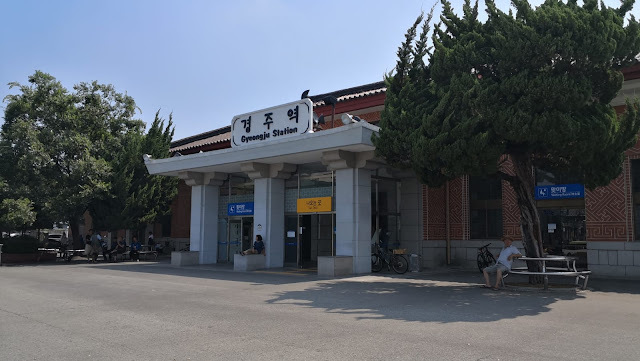 Normal Train: Cheaper than the KTX service, there is normal train services out of Gyeongju Station if you're on a budget or looking for a scenic route. We took the normal train out of Gyeongju to Busan, and the whole journey took around the same time as the KTX trip from Seoul. Considering that Busan is much closer to Gyeongju than Seoul, you can imagine how much slower the train is traveling. Also, the normal train stops at Bujeon Station in Busan, rather than Busan Station if you're taking the KTX. In terms of comfort, wouldn't say that the normal train differs significantly from the KTX. 3. Bus: From my cursory Google search I know you can take the bus to and from the Gyeongju Express Terminal if you're heading to or coming from Busan, but we skipped this option because most of the people at Gyeongju are not really good in English and our Korean is just plain non-existent. I would imagine the bus option being the cheapest but we wanted to be safe so we went with the train option instead.